The 1918 flu pandemic (the Spanish Flu) was an unusually severe and deadly influenza pandemic that spread across the world. Historical and epidemiological data are inadequate to identify the geographic origin. Most victims were healthy young adults, in contrast to most influenza outbreaks which predominantly affect juvenile, elderly, or weakened patients. The flu pandemic was implicated in the outbreak of encephalitis lethargica in the 1920s. The pandemic lasted from June 1917 to December 1920, spreading even to the Arctic and remote Pacific islands. Between 50 and 100 million died, making it one of the deadliest natural disasters in human history. An estimated 50 million people, about 3% of the world's population (1.8 billion at the time), died of the disease. Some 500 million, or 28% (≈1/4) were infected. Figure 1. Soldiers from Fort Riley, Kansas ill with Spanish influenza at a hospital ward at Camp Funston in 1918, and two American Red Cross nurses demonstrate treatment practices during the influenza pandemic of 1918. Tissue samples from frozen victims were used to reproduce the virus for study. Among the conclusions of this research is that the virus kills via a cytokine storm (overreaction of the body's immune system) which perhaps explains its unusually severe nature and the concentrated age profile of its victims. The strong immune systems of young adults ravaged the body, whereas the weaker immune systems of children and middle-aged adults resulted in fewer deaths. Although the first cases were registered in the continental U.S. and the rest of Europe long before getting to Spain, the 1918 pandemic received its nickname "Spanish flu" because Spain, a neutral country in WWI, had no censorship of news regarding the disease and its consequences. Spanish King Alfonso XIII became gravely ill and was the highest-profile patient about whom there was coverage, hence the widest and most reliable news coverage came from Spain, giving the false impression that Spain was most affected. 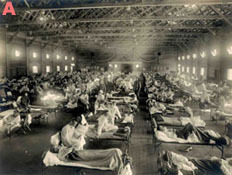 While World War I did not cause the flu, the close troop quarters and massive troop movements hastened the pandemic and probably both increased transmission and augmented mutation; it may also have increased the lethality of the virus. Some speculate that the soldiers' immune systems were weakened by malnourishment as well as the stresses of combat and chemical attacks, increasing their susceptibility. Andrew Price-Smith has made the controversial argument that the virus helped tip the balance of power in the latter days of the war towards the Allied cause. He provides data that the viral waves hit the Central Powers before they hit the Allied powers, and that both morbidity and mortality in Germany and Austria were considerably higher than in Britain and France. A large factor in the worldwide occurrence of this flu was increased travel. Modern transportation systems made it easier for soldiers, sailors, and civilian travelers to spread the disease. In the United States the disease was first observed at Fort Riley, Kansas, on March 4, 1918, and Queens, New York, on March 11, 1918. In August 1918, a more virulent strain appeared simultaneously in Brest, France, in Freetown, Sierra Leone, and in the U.S. at Boston, Massachusetts. The Allies of World War I came to call it the Spanish flu, primarily because the pandemic received greater press attention after it moved from France to Spain in November 1918. Spain was not involved in the war and had not imposed wartime censorship. Some theorized that the flu originated in the Far East. Dr. C. Hannoun, leading expert of the 1918 flu for the Institut Pasteur, asserted that the former virus was likely to have come from China, mutated in the United States near Boston, and spread to Brest, France, Europe's battlefields, Europe, and the world using Allied soldiers and sailors as main spreaders. Hannoun considered several other theories of origin, such as Spain, Kansas, and Brest, as being possible but not likely. Historian Alfred W. Crosby speculated that the flu originated in Kansas. Political scientist Andrew Price-Smith published data from the Austrian archives suggesting that the influenza had earlier origins, beginning in Austria in the spring of 1917. Popular writer John Barry echoed Crosby in describing Haskell County, Kansas as the likely point of origin. 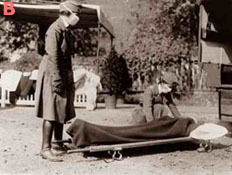 Investigative work by a British team, led by virologist John Oxford of St Bartholomew's Hospital and the Royal London Hospital, has suggested that a major British troop staging camp in Étaples, France was at the center of the 1918 flu pandemic or was the location of a significant precursor virus.